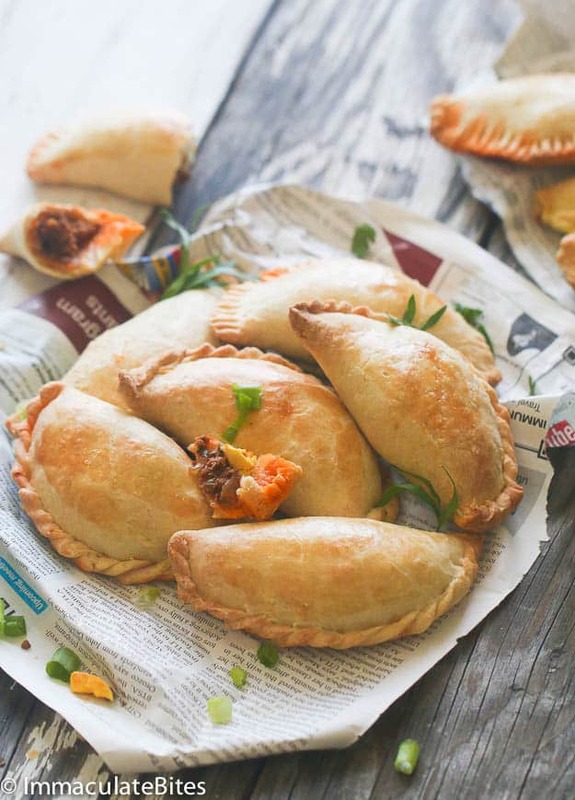 African Meat Pie (Beef Empanada)- slightly sweet , flaky and crusty with a succulent beef filling .Comes together quickly and flies off the table. Simply Delicious!! Believe me when I say it tastes divine. The joy of this recipe is the numerous variety of fillings around the world. Meat pie can be an ethnic success and render any novice chef into a well sought out after caterer! Trust me.. With the flaky, crispy savory crust coupled with sweet succulent spices, count me in. My love for meat pies means that you better believe I am always looking out for alternate recipes. The best ones are all have the same unique trait… A sumptuous flaky crust. Admittedly, I have frequently nibbled on the pie crust and thrown away the pie filling. See folks for me, the crust rules! 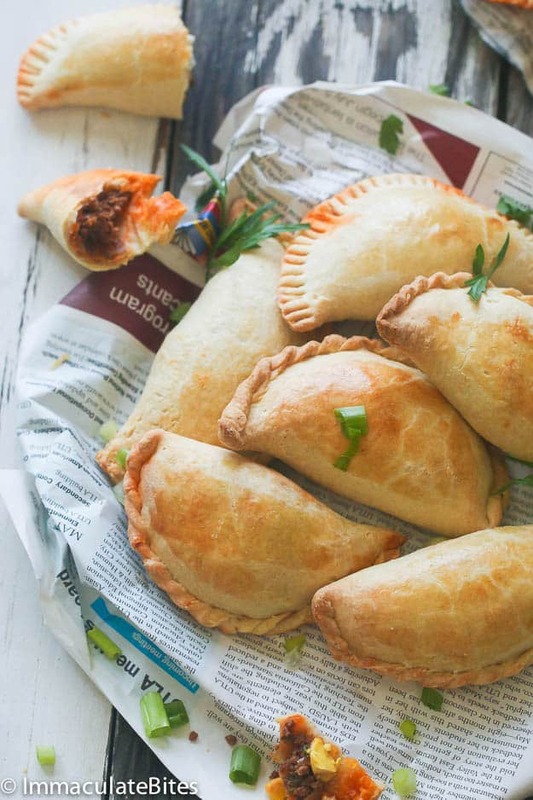 Now lets talk about these African meat pies and what makes them different. 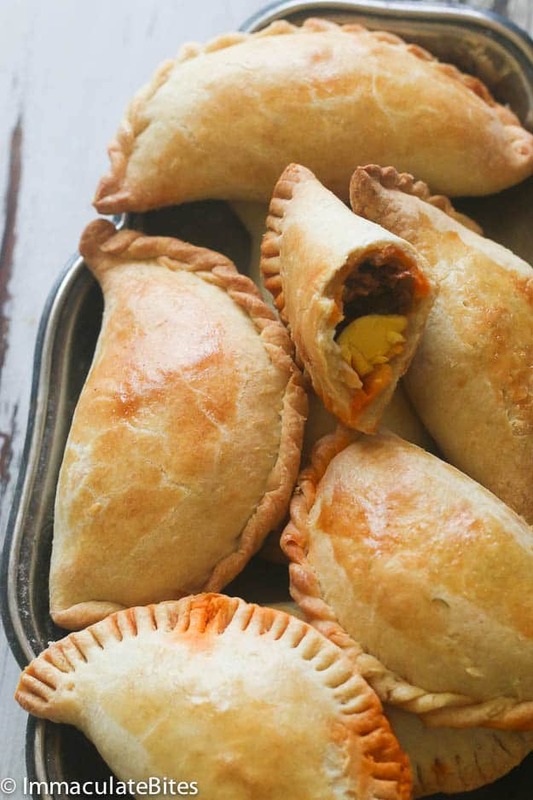 First of all Empanada lovers you will not be disappointed, from all the recipes sampled I feel that this recipe is most close to the Argentinian empanada, with a slight twist. In addition to butter and flour we add milk and eggs for a creamy, smooth and tender dough. Now keep in mind, there are no hard or fast rules about what goes into a meat pie every family or street vendors pie is known to have it’s own secret ingredient. Now I share my secret, it is the tasty filling of ground meat, onions, tomatoes, parsley, green onions which makes for a flavorful, moist and tender pie. Now if you’ve baked any kind of pie, you know that the work comes with kneading and creating the dough. All that being said, if you are a lover like I am, then you can make numerous batches of dough and freeze them for future usage. That makes this meal a 30 minute adventure after defrosting. (If you look in my freezer I always have a stack of unbaked pies, my son loves this and makes for a wonderful ‘lunch’ option for him at school). 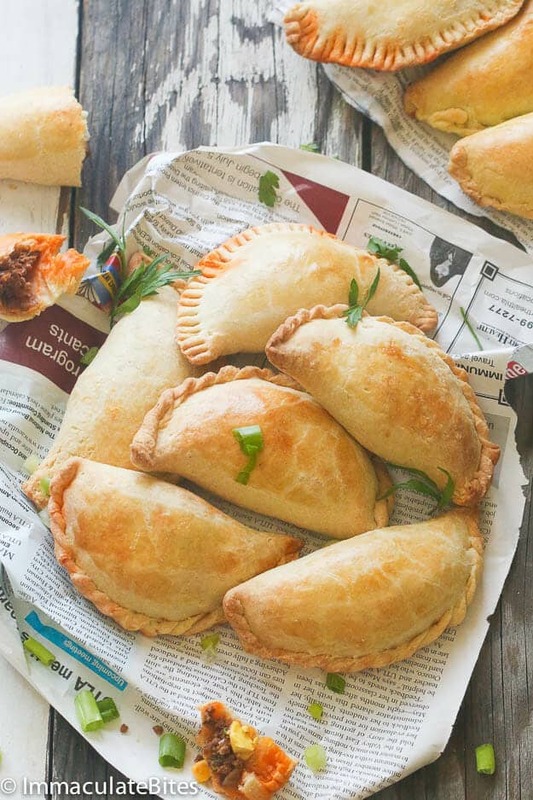 African style empanadas - slightly sweet , flaky and crusty with a succulent filling. In a food processor or by hand, mix together salt, sugar ,butter blend well Add the egg, milk in small amounts, pulse until combined and dough holds together in a soft ball. 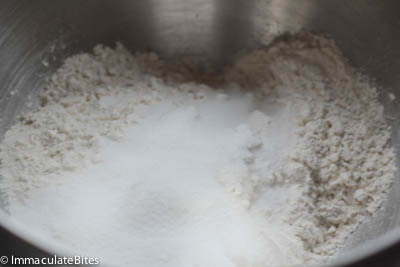 Place the dough on a well floured surface . Divide it into 2 and roll it out . 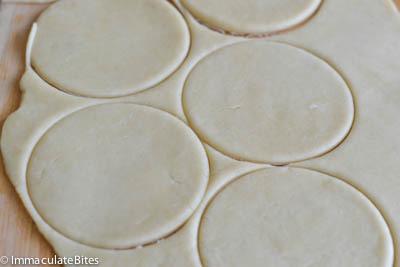 Using a large mouth, glass glass or bowl about 4 - 5 " cut out circles by gently pressing on the dough and releasing it, shaping the meat pie dough. Continue cutting out dough until all dough has been cut. Refrigerate for at least 30 minutes or until ready to use. Add 2 tablespoon of oil to a sauce pan, followed by onions, garlic, chicken bouillon tomato sauce and paprika . 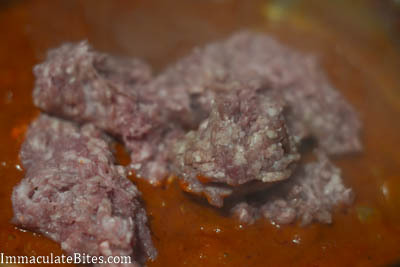 Let it simmer for about 10 minutes, stirring frequently to prevent burning, add about ½ cup of water if needed. 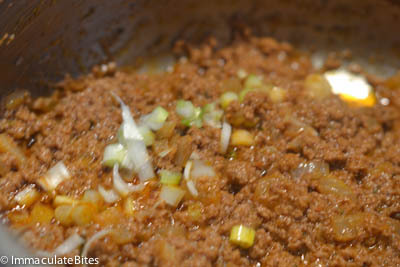 Then, add ground meat and continue cooking for about 10 or more minutes. Finally add green onions and parsley, white pepper. Followed by salt to taste Adjust seasonings to taste . Remove from stove top and let it cool. 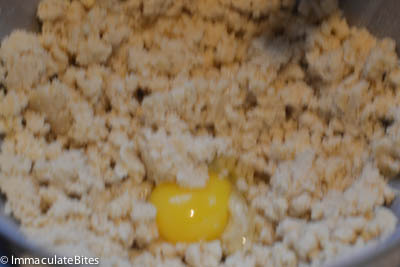 Scoop a heaping tablespoon of filling into each circle, top with egg and brush the egg white around half of the circle. 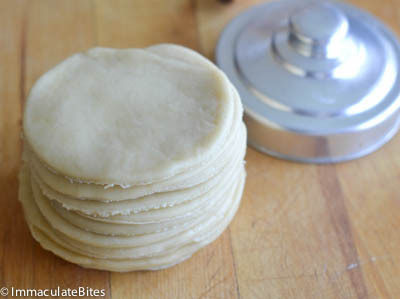 Fold over twist and and press with fingers gently to seal the edges of the meat pie. Another way of sealing is by pressing the tines of a fork along the edges of the dough. 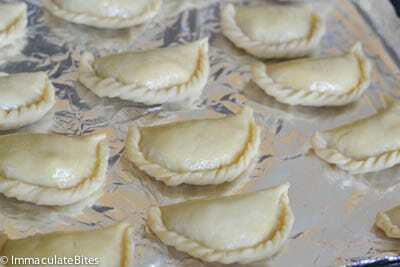 Carefully place each meat pie on a baking sheet or you may freeze to use later. Set oven temperature to 350 degrees .Bake for about 30 minutes . I noticed you didn’t use baking powder for the dough. The last set I made was kinda tough, the dough was shrinking and even in the oven the fillings came out. Was it because of the baking powder? Sorry to hear that. I can’t definitely pin point, but there could be a couple of reasons why it turned out that way. It could be that you over mixed it or rolled out excessively. Or it could possibly be that the ingredients are too warm and not using enough butter. Hi! Your recipe sounds yum! When you freeze the uncooked pies, do you defrost before baking or bake from frozen. If you defrost before baking, for how long? And if you bake from frozen, how long do you bake for and at what temperature? Sorry for bombarding you with all these questions . I look forward to your response. Thanks in advance! No worries about the questions. I usually bake from frozen and add about 6 or more minutes . You might have to add more minutes , use your best judgement , until it is cooked through. This was my first time making these pies in my life. They turned good. I followed everything to the T. I don’t have a food processor, l used the bread maker instead to mix the ingredients. The only concern l have is that my crust was a bit hard instead of soft and flaky. I am wondering what lncan next time l try to make this again? Appreciate your feedback. 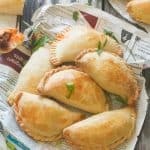 Hi how i can bake it on jiko i don’t have oven. Sorry, I don’t know what jiko is. I tried searching in the directions for what setting you set the oven to in order to bake the meat pies and I did not see it. and for how long? I feel you! I used to buy this every after school back home. 🙂 As for the tomato sauce, please use the canned ones. You can usually buy those at the groceries. Thanks ! Yes, I have . I believe I do have one of his cookbooks. Might have to look for the fish pastel and the pepper soup- cause it sounds delicious. Hello do you think using flaky biscuit dough would work in the place of making the dough from scratch? I can’t say for sure . I have not used pre made biscuit dough for this recipe. If you do, please let me know how it works out for you. Thanks! Agree! Glad to hear it worked out well for you. My boyfriend’s from togo I am trying different dishes I think he’s gonna love this one I sure do. He sure would! It’s always a crowd favorite.Happy Cooking!!! 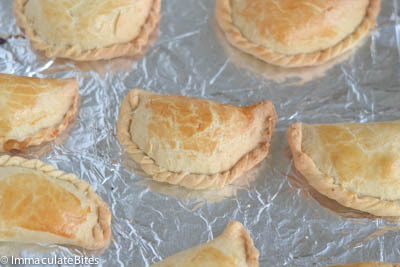 Imma, I’ve been playing around with empanadas and looking for the dough that would give me a flakey fried pie. I found your recipe but you said you had not tried frying because you felt they would be to greasy like my fried pies were turning out. A friend told me the reason they were turning out greasy was because my grease was not hot enough. I had not fried any using your dough only baked as you suggested. I ran the temp on my deep fryer up to 400 degrees and fried a pie made with your dough for 2 minutes. What I ended up with was to me the perfect (not greasy) very flakey pie. I smoke a beef or pork roast 2 or three times each month year round. I use the smoked meat for my filling. Thanks for the recipe. Thank you so much Ruben. Appreciate you taking the time to share this with us. 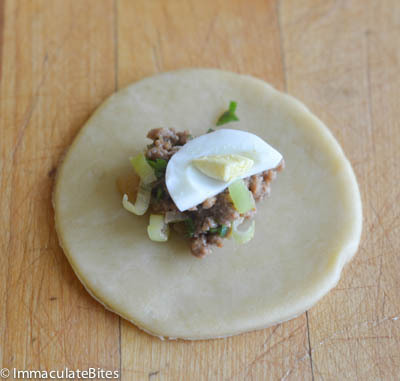 Am definitely going to fry these empanadas – next time I make it . You rock!!! Hi Agnes! You sure can. I do it all the time – make sure you wrap tightly and place in a ziplock bag. Going to try this recipe this christmas. I have a question. Would you call the dough a shortcrust pastry? Or ts jes a variation that tastes like shortcrust pastry? Hi Toke! Just a variation that tastes like a short crust pastry. Merry Christmas !!!! My pies came out incredible and sooo crispy. Damn! they were so good. Thank you so much for helping me have a taste of home again. My pleasure! Glad to hear it brought back fond memories. Hi there. I want to ask, when making the dough, do you add softened (room temperature butter) to the food processor to blend? 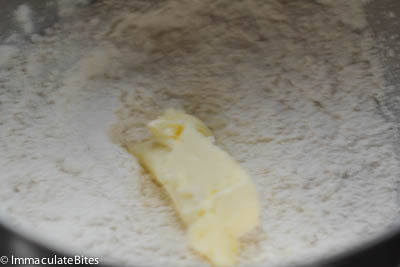 I know typically to make a flaky crust, one adds very cold cubed butter and pulses it with flour in the food processor. So I am wondering if this is the same method or different? I actually made your Jamaican beef patties the other night, which were delicious by the way. It was very flaky. But I am curious though to try this other kind of dough and wondering if it might yield a softer dough (which I would tend to prefer over the very flaky and crispy dough for this kind of meat pie). Thank you. Yes I do, and it does make for a slightly soft dough. Although hardly noticeable to some . If you do give it a try let me know how you like it .Thanks! Where are you located chibuike? Sorry I don’t do cake decorations ! Maybe sometime in the future. Yes . On the baking pan just brush with a little bit of oil . I used oil spray. I want to like this recipe, but the layout of the directions and ingredients is horrid. It says one egg, but then add EGGS to the flour. Which is right? One or two? It never says what to do with the smoked paprika. Boullion goes in early, but is way down the list of ingredients, which usually go in order. Flour is never mentioned in the directions. I have made two rounds of dough, wasting the first batch, and now I don’t even know if the second batch will work, with two eggs in it, per directions, instead of 1, in list of ingredients. I probably have wasted another cup of butter and now 8 cups of flour. So sorry to hear about this. I have updated the instructions and ingredients to make it more clearer. Thnx ma’am, i appreciate, and i just learnt a new recipe for meatpie. Your recipe for the meat pies sound amazing. 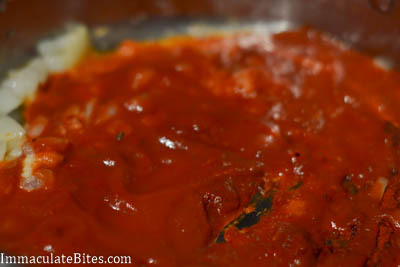 What type of tomato sauce do you use? Is it tinned tomatoes, passata or your own special recipe? It’s tinned tomatoes . Use your favorite kind. Hi Imma, nice recipes and procedures, thank you. After mixing my dough it justrefused to come together. It’s not stretching at all, it breaks so bad as I try rolling it out . Gosh!!!! Its very frustrating. Plz what could be the cause and how can i remedy it? Plz i need to make it now, help me sis. AWESOME! WELCOME BACK! Little Sis! I was wondering where you’ve been hiding … haven’t seen you here in a while . Glad to hear it worked out well for you. Must we refrigerate the dough? No you don’t have too! Hi, just wanted to thank you for all your recipes and ideas…it’s always a help when i want to try something new or need african recipes. My husband is Cameroonian and he was wondering from who i learned cooking his favorite meals like meat pies, N’Dole…. Especially the kids love meat pie so much. So glad to hear hubby is enjoying the meals…I know what you mean about these meat pies-they are my weakness!!! Thanks for taking the time to try out my recipes . Soo appreciate you! Hello Imma, thank you for this recipe. I have one question. can the pie be fried instead of baked? Hi Malaika! To be honest, I have never tried frying this pie- I think it would soak up tons of oil and maybe fall apart, you might have to add more flour to make it firm enough. Thank u loads imma. The tomato sauce, is it the type we buy in tins or sachets from the market? 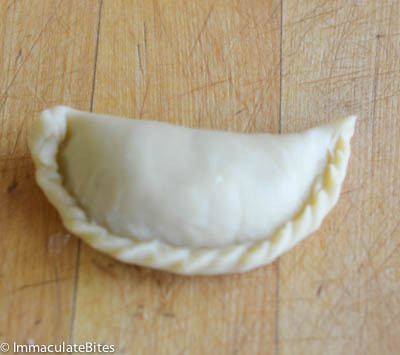 I have fried empanadas before right before serving…make sure oil is hot and put enough to cover pies. Drain on paper towels and keep in warm oven. Frying gives the crust a more crisper texture than baking. No need to add baking powder or soda? No, no need for that! Have you added cheese before? Hi Imma, Am Emmanuel, nice one, my is question. For the recipe did you use all purpose flour? Melanie, I have never tried frying this meat pie because I feel they will be too oily. 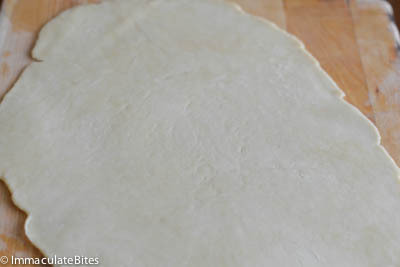 You may use this fish roll dough here https://africanbites.com/?p=3377. Just replace the fish with meat. Let me how it works out. Thanks for stopping by! Pls can I make meat pie with stove instead of oven? Happy New Year!!! I have a questions; if you freeze the dough do you bake them longer or at a higher temperature. Thanks in advance. Ola, you bake it longer about but the oven temperature stays the same. Happy new year to you too! 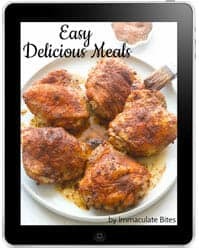 Hi immaculate this is Doreen I love ur site and will definitely try some of the tasty bites.love and may God continue to empower you. Thanks Doreen, Wishing you a Happy New year! I’m excited to make this recipe for my family and a friend who is on bed rest. My only question is what temperature the oven should be? Amanda the temperature is 350 degrees, you’re friend would be thrilled with this empanadas . Hi Imma, I did try the meat pie recipe and it came out good. 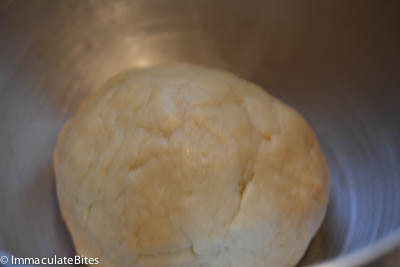 The only problem I had was to roll the dough, it was kind of a little bit tough to roll so I was straining quite a bit. What could be done to make the dough a little bit softer; maybe to add a little bit of water you think? Thanks a lot. Kelsey ,try adding about a 1/4 more of water or milk to the dough. Thanks for the feedback. I did the meat pie again adding 1/4 cup of milk and it came out super good. No more straining rolling the dough. I believe I made several errors the first time. I realized I did not put enough butter and I did refrigerate the dough before cutting instead of vice versa. Thanks so much Imma, you have made me to be a proud cook serving tasty foods. Looks yummy, will definitely try this out. I didn’t know I could use food processor to make dough.